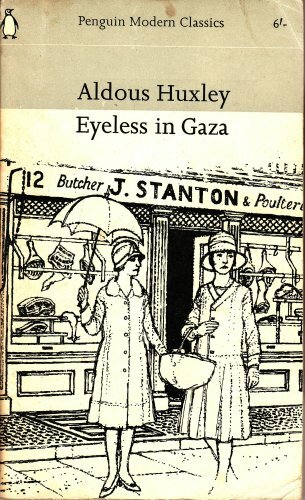 Eyeless in Gaza is a novel exploring the spiritual roots of virtue and vice through Anthony and Brian. Anthony is shy and delicate, armored in intellectual cynicism and passivity. Anthony’s lack of conviction and moral cowardice lies in contrast to his outward beauty and intellectual powers. Brian is a kind and gentle soul with a debilitating stutter ridiculed by his friends as horse face. What Brian lacks in outward beauty is more than made up by his sensitiveness towards others, particularly Anthony, and almost puritan belief in self-restraint. The novel is a collection of scenes chasing Anthony, the main protagonist, and Brian through adolescence, adulthood and finally middle age. Anthony is on a journey to find himself and confront his cowardice. Brian’s journey ends tragically in unrequited love and ultimate betrayal. The book is a reference to the biblical Samson, robbed of his once invincible strength, shorn of his hair with eyes burned out, chained to a pillar in the temple of his enemies as entertainment. Samson prays to God for strength bringing down the entire temple on himself and his enemies. Huxley does an excellent job of capturing Anthony’s journey from a shy youth with a touch of innocence into middle-aged intellectual cynic who still struggles to find the moral courage to confront personal matters. The scene where Brian finally consoles Anthony about his mother’s death was really touching. Which is why I found Anthony’s character thoroughly revulsive as the story progressed, made all the worse in contrast with Brian who had the courage to stand up to others in moral affairs despite his debilitating stutter. In the end he becomes the victim of his own asceticism when he is robbed of his one true love. Anthony is nothing like Samson. He is never able to muster courage and in the end becomes a mystic and pacifist who must find courage within himself for the first time to stand up for all that he believes in and all that he loves. However, the distastefulness of Anthony’s cowardice is only made so by the revelation that we all have moments when we can only wish we took a harder stand, those moments that feel so painful in retrospect when we looked on passively when we should have taken a stand.